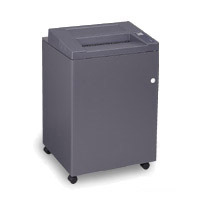 The GBC 6060X paper shredder is a medium-duty, cross cut production shredder that cuts up to 26 sheets at once into 3/16" x 2 3/8" shreds. This model offers greater security and bulk reduction than the strip cut 6120S, but has many of its same capabilities. 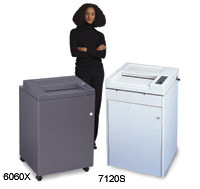 The funneled 16" wide throat allows for all types of shredding operations from standard office documents up to EDP size/computer paper. It is equipped with GBCs Jam-Stopper electronics: bag-full sensor shuts machine off before jams, automatic stop eliminates motor wear and tear, and indicator light informs the operator when waste bin is full. The automatic shut off feature is triggered once the cabinet door is opened. The extra large, 41 gallon waste bin eliminates the need for frequent bag changes. GBC Shredmaster production shredders are built for years of reliable service and are backed by a complete three year manufacturers warranty, with lifetime on cutting heads. 37.5" x 25" x 23"